I beg your indulgence during this, the month of my birth, as I continue to reflect on the events, circumstances and real-life characters that formed the basis for my nineteenth century characters in the “Home to Milford College” series. The hero of The Preacher’s Promise, Virgil Smithson, seems to be have a bit of a Superman complex. He’s a preacher who draws crowds with his fiery oratory, a skilled blacksmith who bought his own freedom, he’s the town’s mayor and is on track to join the statehouse as a representative for the state of Georgia—all just after the Civil War ends. Impossible? 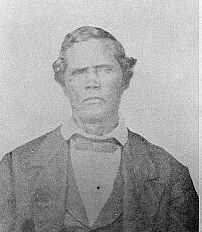 See the life story of one Reverend Wilkes B. Flagg (pictured above from the Georgia Archives), a blacksmith whose story actually predates Virgil’s story by several decades. Reverend Flagg bought himself and his family out of slavery. In the Reconstruction era, he bought a lease on a large former plantation of more than 1,000 acres and established a community where the formerly enslaved could earn a living for themselves. He also established a black school at his church and was able to attract teachers from the American Missionary Society to teach black children. His school was the first to teach African American children in Milledgeville, Georgia. The church that he established, Flagg Chapel Baptist Church, still stands today. He died in 1878. The more that I learn about history, the more I learn we are taught so much about the generalities of history and not as much the particular exceptions who do not fit in to any particular rule. Thanks to exemplars like the Reverend Wilkes B. Flagg, I am able to create historical heroes like Virgil Smithson—a strong Black man every bit the hero for my teacher heroine, Amanda Stewart. For Chapter one of Amanda and Virgil’s love story, see my entry as part of Harlequin’s So You Think You Can Write contest. The top fifty will be selected this week. If you like the story, feel free to leave a comment at the end—it’s not exactly a vote, but it can’t hurt! This entry was tagged African American, Georgia, Reconstruction Era. Bookmark the permalink. Found this very interesting! I’ve been to a Flagg Chapel Baptist Church in Jackson, MS. I wonder how the congregations are related? What an inspiring story! Thanks for sharing your research! They may be related, who knows! Thanks for the comment. I just wanted to give folks some insight to the existence of someone like Virgil. Thanks for stopping by! I left a comment but wonder, is there a way we can vote? Or is that just left up to the editors? It’s all in the editor’s hands at this point, but I sure appreciate the comments! Maybe the comments will help them make up their minds about the next round! Thanks for stopping by! Excellent post. I’m interested in research for this time period. My post civil war story is set in 1866 or 1867, can’t remember which, but I know there were a good number of ex-slaves holding political office and wondered about middle Georgia, my setting. Can you suggest how I can find names and histories? Old newspapers are good, but it takes so much time. BTW, If your entry doesn’t make the 50, I’ll be stunned. I know how hard you’ve worked. You’re ready. I’ll send you a little list by email if you want, but I’ve always been intrigued by this little slice of time where black men were able to hold office. Virgil comes out of those ones who were more poised for this opportunity than others. I appreciate your kind words about my unusual little story and wish you the best of luck as well! Thank you for stopping by!